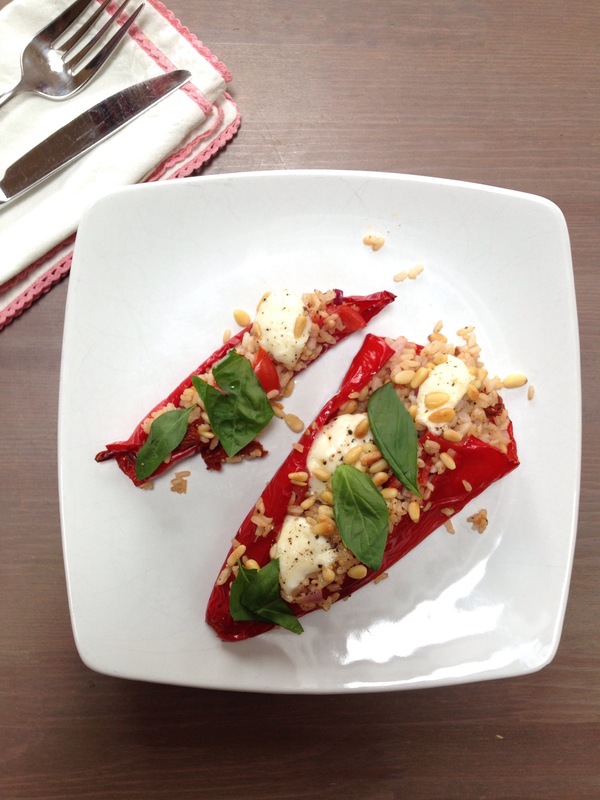 Stuffed peppers are a delicious way to increase your vegetable intake for the day. If you don’t have peppers to hand you can easily substitute with courgettes, beef tomatoes or portobello mushrooms. Whatever takes your fancy. I’ve used mozzarella cheese to layer on top of this rice dish but if you’re not taking dairy my guacamole or chopped avocado works really well. 1/8 small red onion, diced into small pieces. Plenty of seasoning, salt and pepper galore! Cook the rice according to the instructions. Then place in a bowl. Add the sundried tomatoes, fresh tomatoes and red onion. Mix to combine. Add generous amounts of salt and pepper to taste. Switch on the fan oven to 180. Slice the peppers just enough to keep whole. Remove interior seeds and pit. Wash. Place in the oven for 10 minutes approx until slightly soft. Fill each pepper with the rice mixture and top with mozerella slices. Sprinkle with pine nuts and grill for 8-10 minutes mins until the cheese is melted and the pine nuts are toasted. Salt is essential for life. Sodium chloride, (salt), regulates the water content of our body. Too much salt and our cells dehydrate but too little and our cells become over flooded with water and can’t function. Generally speaking, most people nowadays are concerned about their salt or sodium intake in their diet. Excess salt has become a health concern and a lot is due to our tendency to reach for processed foods. From bread to baked beans, cereals to cookies, pre prepared meals to party food, so much of the food we eat is processed and laced with salt. 80% of our salt intake comes from processed foods while only 20% from the salt we add to our meals. Our tendency to eat a lot of processed food is reflective our our busy lifestyles and a move away from the kitchen and home cooking. Since i began cooking the majority of our family meals from scratch, ( I’m no angel though, I still purchase processed foods, some with 2017 expiry dates!!! ) I find I need to add salt to meals as I’m not getting enough through a plant based fresh diet! Using good quality, unprocessed salt like pink himalayan salt, retains all the valuable nourishing minerals that our body utilises for various functions.